Drivers ignorant of tyre safety | What Car? 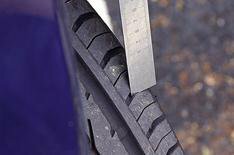 Two out of five motorists claim never to have checked their tyres, according to a new survey. It's recommended that you check your tyres' pressure once a week, as properly inflated tyres help to improve fuel economy and reduce CO2 emissions. The minimum legal tread depth is 1.6mm, but a tyre's effectiveness drops significantly when this falls below 3mm. Continental says that when braking from 70mph in wet weather, a car with 1.6mm of tyre tread will still be travelling when the same car with 3mm of tread will have already stopped. The company has launched a new website www.3minmax.com - where it offers advice on how to carry out simple checks on your tyres.